The IHBC has welcomed Prospect’s new report – Heritage: cold climate to ice age – which highlights the concerns of Prospect members after a decade of funding cuts to the heritage sector and the new uncertainty created by Brexit. This important work will help us continue to campaign on the issues affecting you at work. Prospect is proud to speak up for the UK’s heritage sector on your behalf. Prospect members in heritage work day in day out to provide enjoyment and education to the country through a better understanding and appreciation of our built, buried and natural heritage, whilst making the industry a success. Together we can ensure the voices of expert workers are heard. Last year over 1000 members participated in our heritage survey and ‘Heritage: cold climate to ice age?’ analyses the results. 82% of our members believe that funding cuts are having an adverse effect on their employing organisation. The survey also finds that consistent cuts have impacted pay and continued to undermine the ability of employers to recruit, retain and motivate staff. Members also reported an increase in work load, adverse impacts on their work/life balance and stress. Concerns were also raised over Brexit and how this will exacerbate both funding and staffing problems. Currently the Government has no clear plan how they will address funding and staffing problems across the heritage sector during and after Brexit. 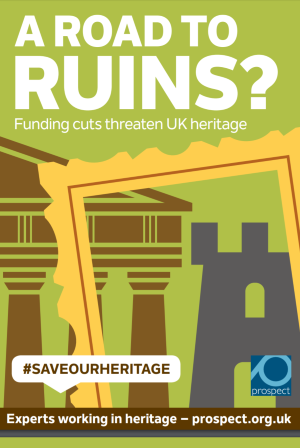 Through the report we have set out a number of proposals which need to be considered to ensure that the heritage sector is not fundamentally damaged. Recognising continued real terms cuts in public funding are counter-productive, causing irreparable damage to the sector and missing the opportunity to maximise the economic contribution the sector makes to the economy. The cuts also have a negative impact on the ability of the sector to positively improve communities and wellbeing. A programme of increased and sustained real terms investment in the heritage sector from the government to reverse the negative impacts of a decade of cuts. Heritage organisations need to make a full assessment of the likely impact of Brexit. Then they can make the case for public funding to replace any funds that may be lost as a result of leaving the EU and for the value that EU nationals bring to their organisations. Prospect needs to work with members and employing bodies to secure a better work-life balance for members, reduce hours and lower stress levels. Prospect already has over 6,000 professional and specialist members working in the sector in areas such as curatorial, conservation, archaeology and visitor services, but the more members we have, the stronger our voice to fight on your behalf. Please consider sharing our report with your colleagues, and encourage them to join Prospect. Don’t forget to share your thoughts on social media with #saveourheritage. A shorter summary report, which is also available in printed-leaflet format to aid in promotion, campaigning and recruitment.